There’s always some form of revolutionary new technology just about to come round the corner but when it finally does get round that corner something else is promising something even more impressive. But here are a few I thought were quite impressive. Now this one seems to have been in development for years but this video I saw recently reminded me of it. And in its latest iteration it looks even more amazing. Quite a few things seem to be turning up this week because of SIGGRAPH 2008. Another one I just came across thanks to Reddit is an automated video enhancing program which uses still photographs to correct dynamic range and low resolution of a still video sequence. That is, a panning video of a still scene. Using Photographs to Enhance Video of a Static Scene does make the video sequence a little surreal afterwards but I’m sure its applications are many considering it’s fully automated. 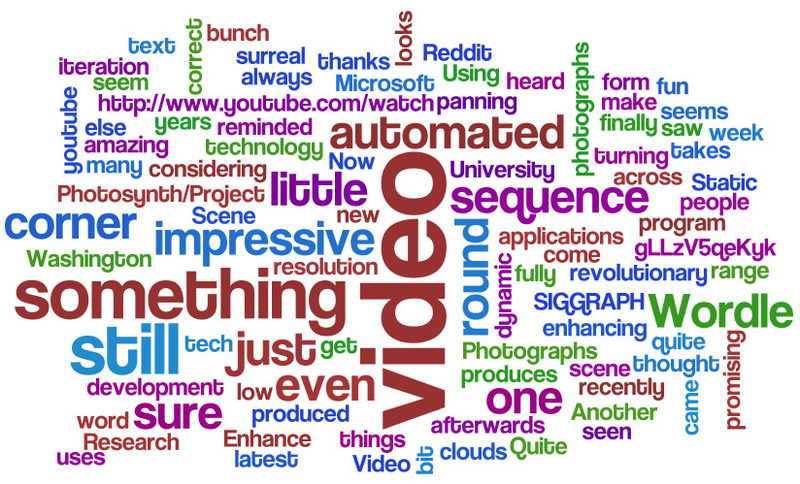 I’m sure most people have heard of this, or seen something produced by it, but Wordle is a fun little bit of tech that takes a bunch of text and produces word clouds. For instance the above Wordle was created from all the words in this post above this point. Of course it’s more useful and impressive when used with a larger body of text. There’s plenty more technologies out there but those were a few that caught my eye.